The townhouses at the Thousand Hills are some of the most preferred vacation homes for big families spending a wonderful escapade in Branson. The three-bedroom townhouse is one of the largest condominiums at Thousand Hills Golf Resort. They are the ultimate accommodation in Branson condominium rental. Along with the complete furnishings, all living rooms feature a queen sized sofa sleepers, fireplaces, private patios with gas grills for you to have an enjoyable grilling. Furnished kitchen with granite countertops, also includes full size appliances, washer/dryer units and premium kitchen packages. The three-bedroom townhouse is abundant with wood flooring in the entry ways and stairways. The master bedroom of the townhouse is located on the main floor and has a private bath including a whirlpool tub with overhead shower. A half bath in the entry area is available for quick shower. The other two bedrooms of the townhouse are located upstairs with vanities within the bedroom, sharing Jack and Jill bathroom but they both have adequate storage/closet space for longer stays. The living area and all bedrooms feature cable television with Showtime and free internet access, and a DVD player as well. This three-bedroom townhouse at Thousand Hills includes a two-car garage with remote access, making it convenient to load or unload things from car to kitchen. The townhouse features a gated entry system for safety. There’s an outdoor pool which is just a walk away from your accommodation. The three-bedroom townhouse is so luxurious, quiet and private, where some Branson “stars” stay while performing at Branson theaters throughout the season. If you want to get the chance to stay with the stars, you need to book your townhouse in advance because they are limited in number. 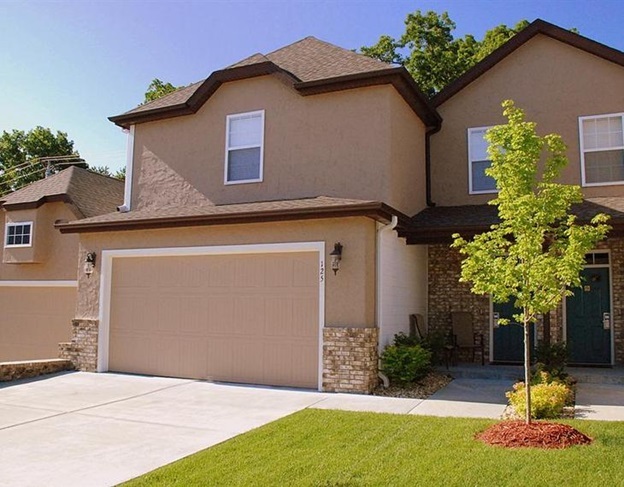 The five-bedroom townhouse at Thousand Hills is roomy and spacious. Nowhere else in the area that has the feature of queen sized sofa sleeper to help accommodate up to twelve people in such luxury. As one of the newest properties of Thousand Hills, these extra-large five-bedroom townhouses have also five full, spacious bathrooms. The master bedroom has a whirlpool tub and a walk-in shower. A winding staircase extends upwards to other four bedrooms upstairs. All bedrooms feature luxury bedding with triple sheeting and premium pillow cases. All bedrooms including living area have televisions with cable channels, wireless internet access, and DVD player. The living area also features a gas fireplace, and you’ll find hardwood floors in the kitchen, dining area and entry way. The private back patios have gas grills that will make dining more preferable than going out. The dining area and an attached kitchen bar area allow you a convenient way to prepare family meal. The fully furnished kitchen features full size appliances including fridge, microwave, dishwasher, and full size washer/dryer units. The townhouses at Thousand Hills are available for nightly, weekly or monthly rentals. Thousand Hills Golf Resort is a favorite vacation destination in Branson where big families can enjoy a luxurious and comfortable accommodation with the fabulous townhouses.